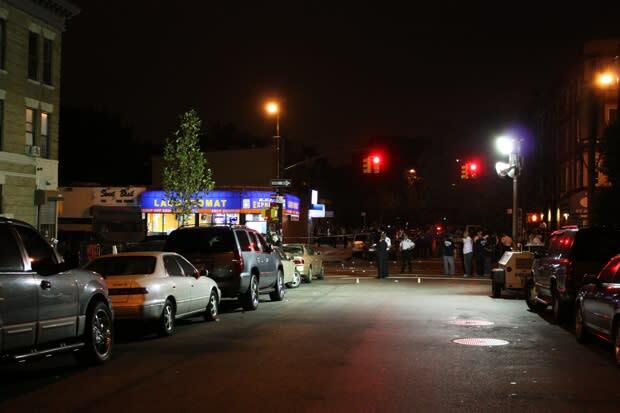 A sustained gun battle erupted in Crown Heights, Brooklyn this evening; according to reports, two are dead and a female police officer is injured. The shooting occurred just after 9:00 pm on Park Place, five blocks north of the West Indian Day Parade on Eastern Parkway. Two distinct volleys of gunfire were audible, and within minutes the area was swarmed with police and EMS. The shooting appears to have occurred along a half-block stretch from just west of the Park Place stop on the Franklin Avenue shuttle through Franklin Avenue to the east. A woman speaking from the window at 601 Park Place near the shuttle stop said that "an old lady got shot in the head." NBC 4 is reporting two civilian deaths and an injured female cop. See above for pictures taken at the crime scene.